We venture out to Playa Nacascolo again today. We make it and what a find! A white sand beach with nobody there. You park in a guarded lot and a mini shuttle takes you through the grounds of the Four Seasons Resort to the beach. Very nice. We made reservations at the Four Seasons for lunch, just so we could drive back in and see the place. Security at the main gate was, well secure, but the lunch trick seemed to work. They don't just let anyone with flip flops and a car mingle with their guests. But we stayed too long at the beach and did not have time to grace the Four Seasons with our presence. Lucky for us because we stopped at the local marina right next to Playa Nacascolo and this is what we got. A cheese burger with as much mayo, mustard, and ketchup as you wanted. Lettuce, tomato & PICKLE!. Fries, salt - well I could go on & on. Suffice to say that I've had a little to many rice and bean lunches, so this was treat. 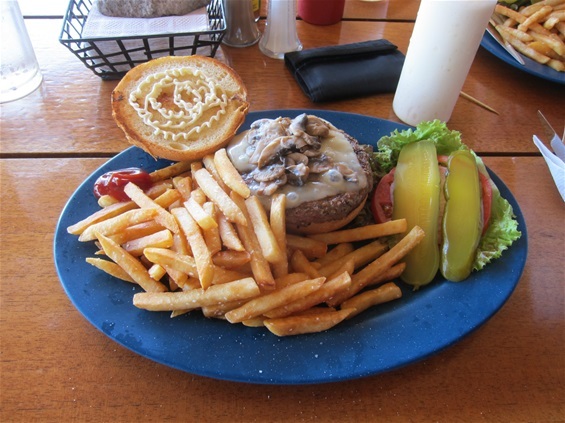 i know you probably want to see pictures of the beach, but an American style burger after 10 weeks took the prize. See the photos page for pixs of Playa Nacascolo.